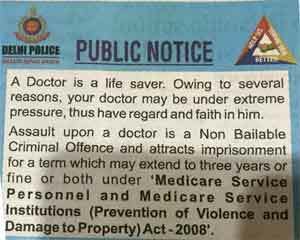 New Delhi: The medical practitioners working in the capital have lauded the public notice issued by the Delhi Police stating that assault of a doctor will be a non-bailable criminal offence and attract imprisonment of three years, or fine or both. The President of AIIMS RDA, Dr Harjit Singh Bhatti, hailed the initiative and stressed on creating more awareness among the public so that the relatives of the patients keep faith on doctors and do not take law into their hands. “Besides newspapers, sign boards mentioning the same should be put up in all hospitals across the country. Awareness drives must be carried out on TV,” Bhatti said. Doctors across the country have been demanding enhanced security on hospital premises over increasing instances of attacks on them by relatives of the patients in the emergency and OPD wards. Earlier they have gone on strike too to protest such assaults. In the month of March Medical, Dialogues team reported an assault case where a Dhule doctor was mercilessly beaten up by attendants of a patient, causing the doctor to land up in the ICU with multiple fractures and loss of vision in one eye. After the whole Maharastra medical doctors protest against it and announced the strike. In support of the same, the all India Institute of Medical Sciences (AIIMS) came up with in the support of Maharashtra doctors.